BioTrust Low Carb Protein Powder is a premium blend of time-released, grass-fed proteins that come from happy, healthy, humanely treated, pasture-raised cows that have not been treated with hormones (rBGH/rBST) or antibiotics. This premium blend of high-quality proteins, which are carefully processed at low temperatures to ensure the best-in-class quality, provides a steady stream of nutrition to your body for hours, helping you feel satisfied longer. BioTrust Low Carb is made only with natural ingredients-that means no artificial sweeteners, flavors, or colors. 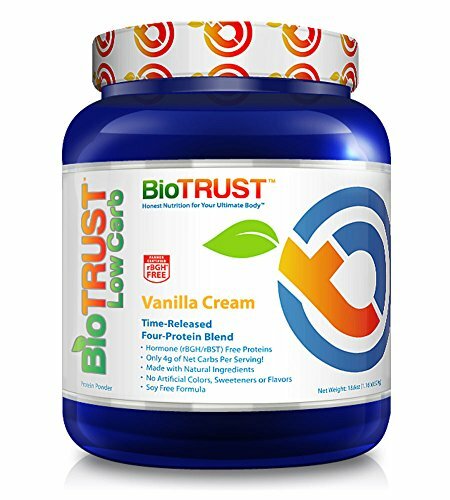 BioTrust Low Carb also contains ProHydrolase, the revolutionary enzyme blend that has been shown to more than double protein absorption all while eliminating the digestive discomfort commonly experienced with whey protein supplements. Not only that, BioTrust Low Carb tastes great. There is over 2.1 million containers sold! 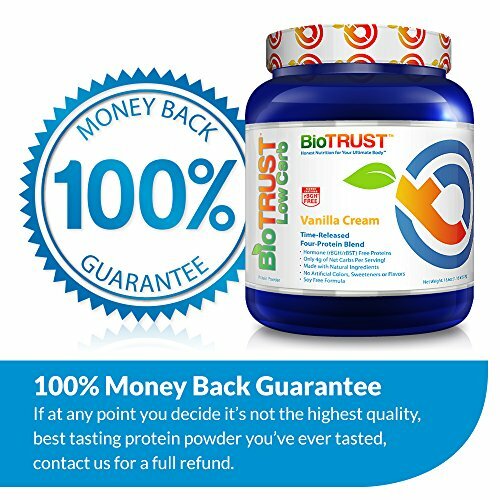 And if for some reason you aren't happy with your purchase, you're always protected by BioTrust's industry-best 1 YEAR 100% Satisfaction Money-Back Guarantee, so there's nothing to lose apart from your most stubborn body fat. Put your trust in BioTrust, the leader in high-quality supplements for a new and healthy you. Certified Hormone (rBGH/rBST) free, 24 g of grass-fed protein per serving from happy, healthy, humanely-treated, pasture-raised cows. Made only with the finest natural ingredients; no artificial sweeteners, flavors, or colors. 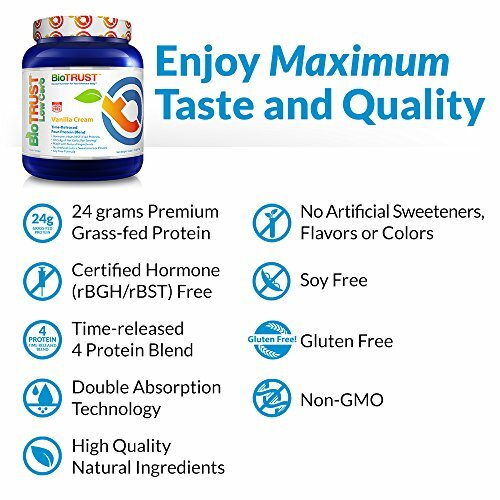 Soy- and gluten-free formula and non-GMO. Independent laboratory testing ensures potency and purity. GMP quality assured. Contains milk-derived ingredients (e.g., whey). Time-released four-protein powder blend, including whey protein isolate, whey protein concentrate, milk protein concentrate, and micellar casein, to keep you satisfied for hours. Contains a new breakthrough enzyme blend ProHydrolase® that has been shown to more than double protein absorption over other products while eliminating the gas and bloating commonly experienced with whey protein powder supplements. Over 2.1 million containers sold. It's not the cheapest, it's simply the best! 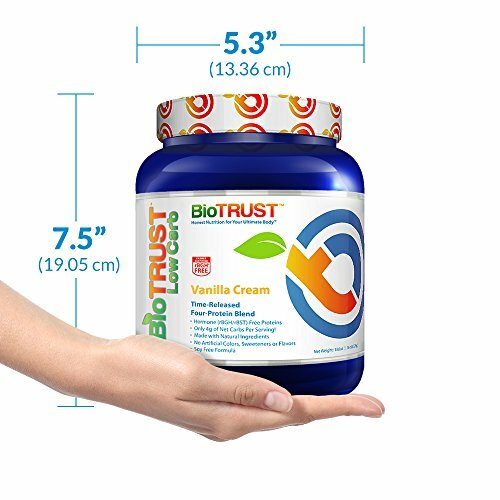 If you have any questions about this product by BioTrust, contact us by completing and submitting the form below. If you are looking for a specif part number, please include it with your message.